Thanks for making 2014 another great year for the Fruit Tree Project. 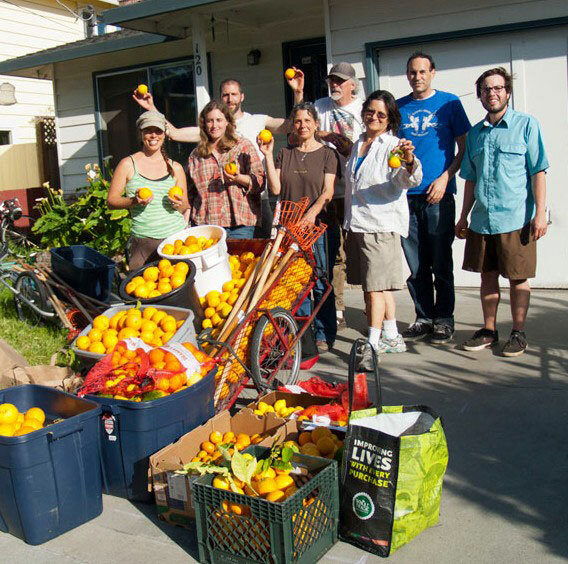 Although the drought brought less abundance of fruit to pick, we did host 25 harvests and workshops this year, picking several tons of fruit, with about 500 pounds given away through food distribution networks. We also hosted two large food festivals, and did some pruning on sites we’ve gathered from over the years. As we move into 2015, the Fruit Tree Project is in for some big changes. For one thing, we are working on a plan to develop a community fruit orchard in collaboration with the City of Santa Cruz. Stay tuned for more details, which may follow later this month. Our hope is to get final approval soon and break ground in February. Another big change is that we are shifting the administration of the program. After years of operating with a volunteer director, we tried last year to make it a half-time staff position. Unfortunately, fund-raising has only been sufficient to cover half my hours. Therefore I am going to be working a lot less than I have in the past, with the project relying more on the leadership of others. We already have a group of awesome volunteers on our steering committee, but without additional help it seems likely our harvest program will have to contract somewhat in the coming year. Similarly, new leadership would allow us to expand the scope of our tree planting and pruning programs. We can also use help with tech support, and with fund-raising. If you’d like to get involved, please visit the volunteer page on our website. Another way you can help the Fruit Tree Project is to donate. As a part of the Santa Cruz Hub For Sustainable Living, we are a tax-exempt non-profit. Fruit Tree Project membership could also make a good holiday gift! Lastly, mark your calendars for DIYine: A Celebration of Homebrewing. On Saturday, February 7th, 6-10pm we’ll be at the Museum of Art and History downtown with an amazing spread of homemade wines, meads, beers, and soft drinks, plus food and live music, and silent auction. All proceeds will go to the Fruit Tree Project. If you are a home-brewer and have something special to share, or if you have something to donate to our silent auction, please contact us.